Citation Information: JCI Insight. 2017;2(18):e92184. https://doi.org/10.1172/jci.insight.92184. GIP-dependent Cushing’s syndrome is caused by ectopic expression of glucose-dependent insulinotropic polypeptide receptor (GIPR) in cortisol-producing adrenal adenomas or in bilateral macronodular adrenal hyperplasias. Molecular mechanisms leading to ectopic GIPR expression in adrenal tissue are not known. Here we performed molecular analyses on adrenocortical adenomas and bilateral macronodular adrenal hyperplasias obtained from 14 patients with GIP-dependent adrenal Cushing’s syndrome and one patient with GIP-dependent aldosteronism. GIPR expression in all adenoma and hyperplasia samples occurred through transcriptional activation of a single allele of the GIPR gene. While no abnormality was detected in proximal GIPR promoter methylation, we identified somatic duplications in chromosome region 19q13.32 containing the GIPR locus in the adrenocortical lesions derived from 3 patients. In 2 adenoma samples, the duplicated 19q13.32 region was rearranged with other chromosome regions, whereas a single tissue sample with hyperplasia had a 19q duplication only. We demonstrated that juxtaposition with cis-acting regulatory sequences such as glucocorticoid response elements in the newly identified genomic environment drives abnormal expression of the translocated GIPR allele in adenoma cells. Altogether, our results provide insight into the molecular pathogenesis of GIP-dependent Cushing’s syndrome, occurring through monoallelic transcriptional activation of GIPR driven in some adrenal lesions by structural variations. Citation Information: JCI Insight. 2017;2(18):e93265. https://doi.org/10.1172/jci.insight.93265. Blockade of immune checkpoint proteins (e.g., CTLA-4, PD-1) improves overall survival in advanced melanoma; however, therapeutic benefit is limited to only a subset of patients. Because checkpoint blockade acts by “removing the brakes” on effector T cells, the efficacy of checkpoint blockade may be constrained by the limited pool of melanoma-reactive T cells in the periphery. In the thymus, autoimmune regulator (Aire) promotes deletion of T cells reactive against self-antigens that are also expressed by tumors. Thus, while protecting against autoimmunity, Aire also limits the generation of melanoma-reactive T cells. Here, we show that Aire deficiency in mice expands the pool of CD4+ T cells capable of melanoma cell eradication and has additive effects with anti–CTLA-4 antibody in slowing melanoma tumor growth and increasing survival. Moreover, pharmacologic blockade of central T cell tolerance and peripheral checkpoint blockade in combination enhanced antimelanoma immunity in a synergistic manner. In melanoma patients treated with anti–CTLA-4 antibody, clinical response to therapy was associated with a human Aire polymorphism. Together, these findings suggest that Aire-mediated central tolerance constrains the efficacy of peripheral checkpoint inhibition and point to simultaneous blockade of Aire and checkpoint inhibitors as a novel strategy to enhance antimelanoma immunity. Citation Information: JCI Insight. 2017;2(18):e93397. https://doi.org/10.1172/jci.insight.93397. Checkpoint inhibitors have demonstrated efficacy in patients with recurrent or metastatic head and neck squamous cell carcinoma (HNSCC). However, the majority of patients do not benefit from these agents. To improve the efficacy of checkpoint inhibitors, intratumoral (i.t.) injection with innate immune activators, TLR7 and TLR9 agonists, were tested along with programmed death-1 receptor (PD-1) blockade. The combination therapy suppressed tumor growth at the primary injected and distant sites in human papillomavirus–negative (HPV-negative) SCC7 and MOC1, and HPV-positive MEER syngeneic mouse models. Abscopal effects and suppression of secondary challenged tumor suggest that local treatment with TLR agonists in combination with anti–PD-1 provided systemic adaptive immunity. I.t. treatment with a TLR7 agonist increased the ratio of M1 to M2 tumor-associated macrophages (TAMs) and promoted the infiltration of tumor-specific IFNγ-producing CD8+ T cells. Anti–PD-1 treatment increased T cell receptor (TCR) clonality of CD8+ T cells in tumors and spleens of treated mice. Collectively, these experiments demonstrate that combination therapy with i.t. delivery of TLR agonists and PD-1 blockade activates TAMs and induces tumor-specific adaptive immune responses, leading to suppression of primary tumor growth and prevention of metastasis in HNSCC models. Citation Information: JCI Insight. 2017;2(18):e94207. https://doi.org/10.1172/jci.insight.94207. Chronic inflammatory diseases, such as periodontal disease, associate with adverse wound healing in response to myocardial infarction (MI). The goal of this study was to elucidate the molecular basis for impaired cardiac wound healing in the setting of periodontal-induced chronic inflammation. Causal network analysis of 168 inflammatory and extracellular matrix genes revealed that chronic inflammation induced by a subseptic dose of Porphyromonas gingivalis lipopolysaccharide (LPS) exacerbated infarct expression of the proinflammatory cytokine Ccl12. Ccl12 prevented initiation of the reparative response by prolonging inflammation and inhibiting fibroblast conversion to myofibroblasts, resulting in diminished scar formation. Macrophage secretion of Ccl12 directly impaired fibronectin and collagen deposition and indirectly stimulated collagen degradation through upregulation of matrix metalloproteinase-2. In post-MI patients, circulating LPS levels strongly associated with the Ccl12 homologue monocyte chemotactic protein 1 (MCP-1). Patients with LPS levels ≥ 1 endotoxin units (EU)/ml (subseptic endotoxemia) at the time of hospitalization had increased end diastolic and systolic dimensions compared with post-MI patients with < 1 EU/ml, indicating that low yet pathological concentrations of circulating LPS adversely impact post-MI left ventricle (LV) remodeling by increasing MCP-1. Our study provides the first evidence to our knowledge that chronic inflammation inhibits reparative fibroblast activation and generates an unfavorable cardiac–healing environment through Ccl12-dependent mechanisms. Citation Information: JCI Insight. 2017;2(18):e94308. 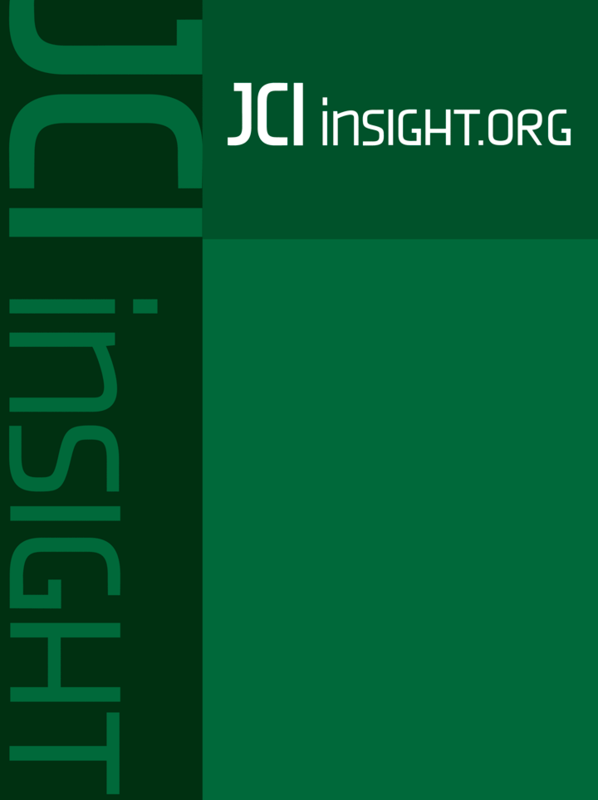 https://doi.org/10.1172/jci.insight.94308. V-domain immunoglobulin suppressor of T cell activation (VISTA) is a recently discovered immune checkpoint ligand that functions to suppress T cell activity. The therapeutic potential of activating this immune checkpoint pathway to reduce inflammatory responses remains untapped, largely due to the inability to derive agonists targeting its unknown receptor. A dimeric construct of the IgV domain of VISTA (VISTA-Fc) was shown to suppress the activation of T cells in vitro. However, this effect required its immobilization on a solid surface, suggesting that VISTA-Fc may display limited efficacy as a VISTA-receptor agonist in vivo. Herein, we have designed a stable pentameric VISTA construct (VISTA.COMP) by genetically fusing its IgV domain to the pentamerization domain from the cartilage oligomeric matrix protein (COMP). In contrast to VISTA-Fc, VISTA.COMP does not require immobilization to inhibit the proliferation of CD4+ T cells undergoing polyclonal activation. Furthermore, we show that VISTA.COMP, but not VISTA-Fc, functions as an immunosuppressive agonist in vivo capable of prolonging the survival of skin allografts in a mouse transplant model as well as rescuing mice from acute concanavalin-A–induced hepatitis. Collectively, we believe our data demonstrate that VISTA.COMP is a checkpoint receptor agonist and the first agent to our knowledge targeting the putative VISTA-receptor to suppress T cell–mediated immune responses. Citation Information: JCI Insight. 2017;2(18):e94715. https://doi.org/10.1172/jci.insight.94715. BACKGROUND. Neuronal remodeling in human heart disease is not well understood. METHODS. Stellate ganglia from patients with cardiomyopathy (CMY) and refractory ventricular arrhythmias undergoing cardiac sympathetic denervation (n = 8), and from organ donors with normal hearts (n = 8) collected at the time of organ procurement were compared. Clinical data on all subjects were reviewed. Electron microscopy (EM), histologic, and immunohistochemical assessments of neurotransmitter profiles, glial activation and distribution, and lipofuscin deposition, a marker of oxidative stress, were quantified. RESULTS. In CMY specimens, lipofuscin deposits were larger, and present in more neurons (26.3% ± 6.3% vs. 16.7% ± 7.6%, P < 0.043), than age-matched controls. EM analysis revealed extensive mitochondrial degeneration in CMY specimens. T cell (CD3+) infiltration was identified in 60% of the CMY samples, with one case having large inflammatory nodules, while none were identified in controls. Myeloperoxidase-immunoreactive neutrophils were also identified at parenchymal sites distinct from inflammatory foci in CMY ganglia, but not in controls. The adrenergic phenotype of pathologic samples revealed a decrease in tyrosine hydroxylase staining intensity compared with controls. Evaluation of cholinergic phenotype by staining for the vesicular acetylcholine transporter revealed a low but comparable number of cholinergic neurons in ganglia from both groups and demonstrated that preganglionic cholinergic innervation was maintained in CMY ganglia. S100 staining (a glial cell marker) demonstrated no differences in glial distribution and relationship to neurons; however, glial activation demonstrated by glial fibrillary acidic protein (GFAP) staining was substantially increased in pathologic specimens compared with controls. CONCLUSIONS. Stellate ganglia from patients with CMY and arrhythmias demonstrate inflammation, neurochemical remodeling, oxidative stress, and satellite glial cell activation. These changes likely contribute to excessive and dysfunctional efferent sympathetic tone, and provide a rationale for sympathectomy as a treatment for arrhythmias in this population. FUNDING. This work was made possible by support from NIH grants HL125730 to OAA, GM107949 to DBH, and HL084261 and OT2OD023848 to KS. Citation Information: JCI Insight. 2017;2(18):e95352. https://doi.org/10.1172/jci.insight.95352. BACKGROUND. Inflammation and monocytes are thought to be important to human malaria pathogenesis. However, the relationship of inflammation and various monocyte functions to acute malaria, recovery from acute malaria, and asymptomatic parasitemia in endemic populations is poorly understood. METHODS. We evaluated plasma cytokine levels, monocyte subsets, monocyte functional responses, and monocyte inflammatory transcriptional profiles of 1- to 10-year-old Kenyan children at the time of presentation with acute uncomplicated malaria and at recovery 6 weeks later; these results were compared with analogous data from asymptomatic children and adults in the same community. RESULTS. Acute malaria was marked by elevated levels of proinflammatory and regulatory cytokines and expansion of the inflammatory “intermediate” monocyte subset that returned to levels of healthy asymptomatic children 6 weeks later. Monocytes displayed activated phenotypes during acute malaria, with changes in surface expression of markers important to innate and adaptive immunity. Functionally, acute malaria monocytes and monocytes from asymptomatic infected children had impaired phagocytosis of P. falciparum–infected erythrocytes relative to asymptomatic children with no blood-stage infection. Monocytes from both acute malaria and recovery time points displayed strong and equivalent cytokine responsiveness to innate immune agonists that were independent of infection status. Monocyte transcriptional profiles revealed regulated and balanced proinflammatory and antiinflammatory and altered phagocytosis gene expression patterns distinct from malaria-naive monocytes. CONCLUSION. These observations provide insights into monocyte functions and the innate immune response during uncomplicated malaria and suggest that asymptomatic parasitemia in children is not clinically benign. FUNDING. Support for this work was provided by NIH/National Institute of Allergy and Infectious Diseases (R01AI095192-05), the Burroughs Wellcome Fund/American Society of Tropical Medicine and Hygiene, and the Rainbow Babies & Children’s Foundation. Citation Information: JCI Insight. 2017;2(18):e95530. https://doi.org/10.1172/jci.insight.95530. Clinical trials in patients with macular edema due to diabetic retinopathy or retinal vein occlusion (RVO) have shown that suppression of VEGF not only improves macular edema, but also reopens closed retinal vessels, prevents progression of vessel closure, and improves retinopathy. In this study, we show the molecular basis for those clinical observations. Increased retinal levels of VEGF in mice cause plugging of retinal vessels with leukocytes, vessel closure, and hypoxia. Suppression of VEGF reduces leukocyte plugging, causing reperfusion of closed vessels. Activation of VEGFR1 contributes to leukocyte recruitment, because it is significantly reduced by an anti-VEGFR1–neutralizing antibody. High VEGF increases transcriptional activity of NF-κB and expression of NF-κB target genes, particularly Vcam1. Injection of an anti-VCAM-1–neutralizing antibody reduces VEGF-induced leukocyte plugging. These data explain the broad range of benefits obtained by VEGF suppression in patients with ischemic retinopathies, provide an important insight into the pathogenesis of RVO and diabetic retinopathy, and suggest that sustained suppression of VEGF early in the course of these diseases may prevent vessel closure, worsening ischemia, and disease progression. This study also identifies VEGFR1 and VCAM-1 as molecular targets whose suppression could supplement VEGF neutralization for treatment of RVO and diabetic retinopathy. Citation Information: JCI Insight. 2017;2(18):e95918. https://doi.org/10.1172/jci.insight.95918. Dystrophin maintains the integrity of striated muscles by linking the actin cytoskeleton with the cell membrane. Duchenne muscular dystrophy (DMD) is caused by mutations in the dystrophin gene (DMD) that result in progressive, debilitating muscle weakness, cardiomyopathy, and a shortened lifespan. Mutations of dystrophin that disrupt the amino-terminal actin-binding domain 1 (ABD-1), encoded by exons 2–8, represent the second-most common cause of DMD. In the present study, we compared three different strategies for CRISPR/Cas9 genome editing to correct mutations in the ABD-1 region of the DMD gene by deleting exons 3–9, 6–9, or 7–11 in human induced pluripotent stem cells (iPSCs) and by assessing the function of iPSC-derived cardiomyocytes. All three exon deletion strategies enabled the expression of truncated dystrophin protein and restoration of cardiomyocyte contractility and calcium transients to varying degrees. We show that deletion of exons 3–9 by genomic editing provides an especially effective means of correcting disease-causing ABD-1 mutations. These findings represent an important step toward eventual correction of common DMD mutations and provide a means of rapidly assessing the expression and function of internally truncated forms of dystrophin-lacking portions of ABD-1. Citation Information: JCI Insight. 2017;2(18):e96101. https://doi.org/10.1172/jci.insight.96101. Dendritic cells (DCs) are important in regulating immunity and tolerance and consist of functionally distinct subsets that differentially regulate T lymphocyte function. The underlying basis for this subset specificity is lacking, particularly in humans, where the classification of tissue DCs is currently incomplete. Examination of healthy human epidermal Langerhans cells and dermal skin cells revealed a tissue CD5-expressing DC subtype. The CD5+ DCs were potent inducers of cytotoxic T cells and Th22 cells. The products of these T cells, IL-22 and IFN-γ, play a key role in the pathogenesis of psoriasis. Remarkably, CD5+ DCs were significantly enriched in lesional psoriatic skin compared with distal tissues, suggesting their involvement in the disease. We show that CD5+ DCs can be differentiated from hematopoietic progenitor cells independently of the CD5– DCs. A progenitor population found in human cord blood and in the dermal skin layer, marked as CD34–CD123+CD117dimCD45RA+, was an immediate precursor of these CD11c+CD1c+CD5+ DCs. Overall, our discovery of the CD5-expressing DC subtype suggests that strategies to regulate their composition or function in the skin will represent an innovative approach for the treatment of immune-mediated disorders in and beyond the skin.